Several waves of severe hail storms have battered SE Queensland over 4 days. The first wave hit the Brookstead area in the Darling Downs late Friday and into early Saturday morning. 120 hectares of cotton was cut the ground along with 80 hectares of wheat. On Sunday the 5th November two waves of severe storms swept through the Brisbane and surrounding areas. The first band of storms for the day occurred before dawn and the second arrived around 5pm. The line of storms at 5pm streched from the NSW border to Kingaroy. Winds to 100km/h resulted in 52,000 homes blacked out in Brisbane. 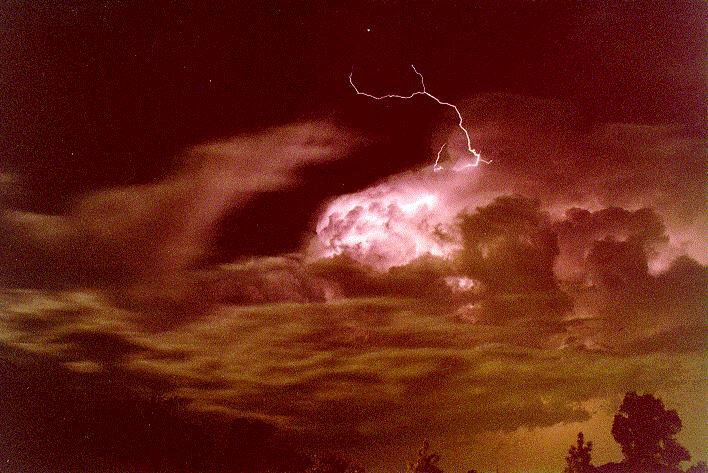 Lightning was occurring at the rate of 300 per 10 minutes with about 15,000 bolts recorded in each band of storms. Hail to golf ball size hit Laidley in the afternoon. Hail damage also occurred in the Darling Downs, Lockyer Valley and the South Burnett region. Apart from the negative effects of the hail, good heavy rainfalls occurred in farm areas suffering from years of drought. On Monday afternoon severe hail storms occurred in many areas affected by the previous days events. Giant hail fell in Bellbowrie ripping up roof tiles and smashing cars. The size of the hail was greater than 7cm in many areas. A fisherman was stuck by lightning and killed while blackouts occurred to 9,500 homes. The same weather system that gave severe storms from Sydney to Brisbane has dumped heavy rain throughout eastern and central parts of Victoria. The Barwon River in Geelong broke its banks with its highest peak since 1952. Many houses and businesses were inundated. In the east, the La Trobe river in Traralgon has also flooded many areas. Weak cumulonimbus development throughout the afternoon in the Metropolitan area preceeded severe electrical storms in the evening. A line of storms moved in from the North West and West from 8pm with golf ball sized hail reported in the Warragamba area. Winds reached at least 70km/h and intense rain occurred in many suburbs throughout Sydney. I recorded 19mm between 9.15 and 9.30pm while Observatory Hill measured 17mm between 9.30 and 10pm. Blackouts affected 6,500 homes and roof damage was reported from Merrylands and Mt Druitt. 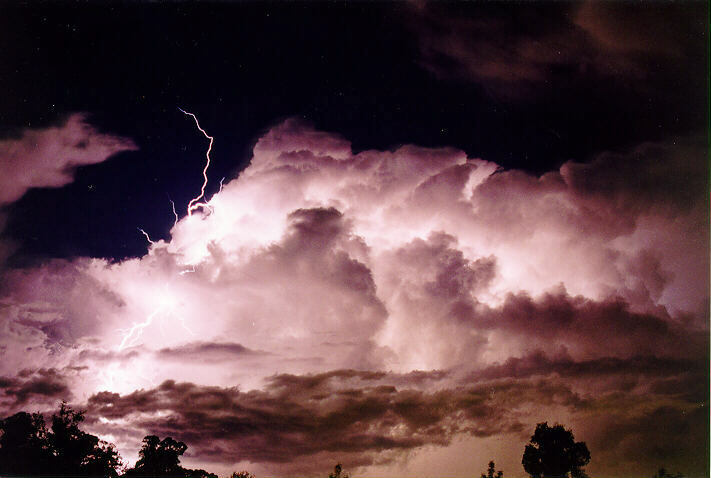 Spectacular lightning displays occurred before, during and after the storm. I observed and photographed lightning rising up from the top of the cumulonimbus towers into clear air on at least 6 occassions within 15 to 20 minutes, as the storms moved away to the South East.